Of the two methods, the replacement ratio is simpler. This approach simply applies a percentage of pre-retirement income to estimate how much one will need during retirement. These ratios typically range from 75 to 90 percent. In other words, the approach assumes that the income need during retirement will be 75 to 90 percent of one’s pre-retirement earnings, an amount that will produce a comparable standard of living. Applying the replacement ratio method to an individual currently earning $100,000 produces a projected retirement annual income need of $75,000 to $90,000 (in today’s dollars). The replacement ratio method is appropriate for younger individuals (those in their 20s or 30s) whose future expenditures or income levels are not known or cannot be reasonably estimated otherwise. For these individuals, a target estimate is sufficient. For older individuals (those who are close to or at their peak income levels, or those who are within 10 or 15 years of retirement), the projected expenses method is preferred. This method provides a more accurate picture of future income needs, because it is based on current expenditures. Also, changes or adjustments in one’s future cash outflow can be more accurately predicted using this method. For example, a couple within ten years of retirement will know whether they can pay off their mortgage. housing—According to the U.S. Census Bureau, around 70 percent of American homeowners have paid off their mortgage by the time they reach 65. If a client is in this group, his or her expense budget will be reduced dramatically. If the client envisions moving to a smaller house or condo, some savings may be realized on housing costs through lower property taxes, maintenance, and other expenses associated with home ownership. insurance bills—Some retirees drop their disability insurance coverage and apply the cash value accumulation of their life insurance policies to increase their retirement income. No longer paying such premiums could represent significant savings. Other insurance premiums can be affected in other ways. For example, medical expenses and premiums for medical expense insurance commonly rise during retirement; additional medical insurance may be necessary. Although Medicare supplement and long-term care insurance are designed for late-life medical needs, they can be very costly. taxes—Income taxes can be lowered significantly by retirement. Unless the client continues to work, he or she should not have any Social Security taxes withheld, because these taxes apply only to earned income. If the client’s gross income will be lower, a lower tax bracket might be realized. All or part of Social Security benefits may be tax free. travel, dining out, other entertainment costs—Many retirees find that these expenses actually climb in the years immediately following their retirement as they enjoy their new freedom. In later retirement years, travel costs and entertainment costs typically decline. automobile expenses—Some retired couples decide that they no longer need two cars. This could represent a significant savings in insurance, repairs, and car payments. Automobile expense may also decline, because driving to work or commuting is no longer necessary. savings—Many savings goals, such as retirement or college for children, have been realized by the time a person retires. 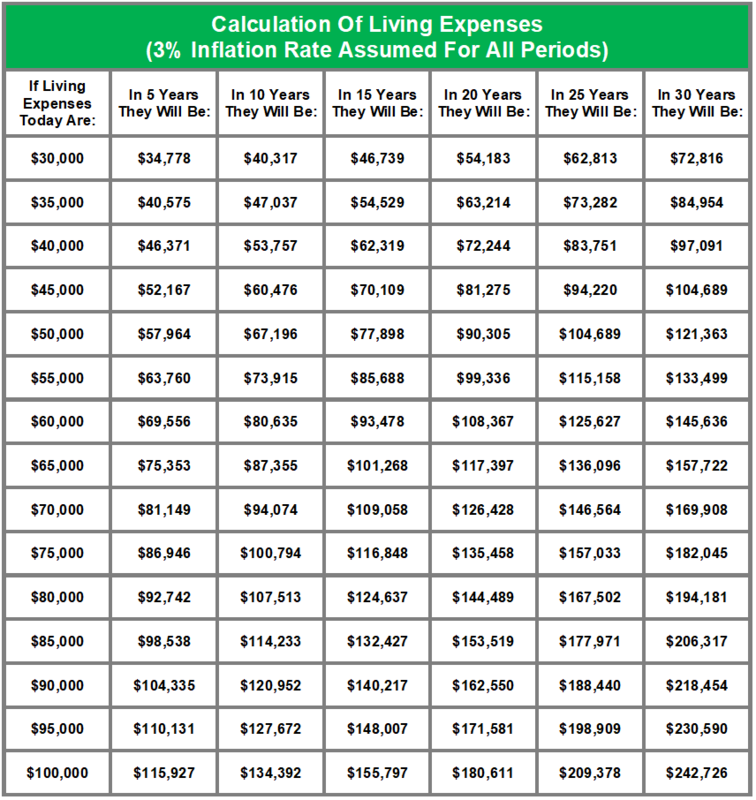 If a couple had been putting $10,000 aside each year for retirement and also saving $10,000 a year for a child’s college education, they will be able to enjoy a “savings” of $20,000 per year in retirement. dependents—By the time a person retires, he or she is likely an “empty-nester.” Children are gone, which reduces expenses. However, today’s reality is such that the client may have some responsibility, financial or otherwise, for aging parents. The closer a client is to his or her retirement, the more precise the estimation of his or her income needs during this period should be. Those who are within a few years of retirement might want to take this a step further and estimate their income goals according to the varying phases of retirement: early, middle, and late. early period—the first eight or ten years. During this period, pre- and post-retirement income needs are largely the same, and the client may actually continue to work and earn a wage. middle period—the next seven or eight years. During this period, expenses typically decline as consumption is lower than that of early retirement. late period—the period that encompasses the period from age 85 on. In this period, the client should address the need for increased health care and the cost of potential long-term care. At this point, we simply have an indication of annual income expenditures and thus a target amount of desired annual income. But this target amount was calculated in terms of today’s dollars; it needs to be translated into tomorrow’s dollars. Taking into account the assumed rate of inflation, what will the income need be when you are ready to retire? The answer to this question is simply a matter of calculating the future value, using the assumed rate of inflation and the number of years until you retire. For example, let’s say Ted, age 47, is currently earning $70,000 a year. His estimate for the income need in retirement is 80 percent of his current income, or approximately $56,000. He plans to retire around the age of 62. Assuming an inflation rate of three percent over the next 15 years, Ted’s annual income need will be close to $86,000 when he retires. Once an annual income goal has been targeted and converted into future dollars, the next step is to apply the expected sources of income. ​well being, and ultimately peace of mind. ​seniors and their families make informed, educated decisions regarding all options available. If you would like information pertaining to another USA based State, please "Click Here"